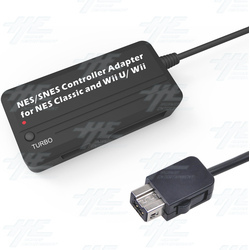 - Compatible with NES Classic Edition and Wii U/Wii system. - Compatible with NES controllers, including joysticks (functionality may vary) - Compatible with SNES Controllers to play the games on NES Classic Edition and Wii U/ Wii system - No extra driver required, plug-n-play - To switch the D-PAD to the Left Stick, press and hold the “START” button and the Directional button “DOWN” for 3 seconds. To remove this setting, press and hold the “START” button and the Directional button “UP” for 3 seconds. - Turbo: The function buttons (A, B, X, Y, L, R) can be set for TURBO. To set Turbo for individual buttons, press and hold the button that you wish to set TURBO for, and the button “TURBO” on the adapter. You’ll find that the TURBO LED will flash, and the setting is finished. To remove the setting for that specific button, press and hold the button you previously set Turbo for and the TURBO button. - HOME: Press and Hold the “START” and “SELECT” buttons for 3 seconds to function as “HOME” button.